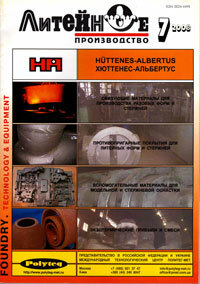 The work outlines the approach to steel casting design and manufacturing process adopted in international foundry practice allowing, as early as in the casting process design stage, to provide for methods of ensuring directional solidification, which make it possible to assure cast product quality at the level of the 1st… 2nd Class of International requirements made on high-duty steel castings. Procedure of designing the casting feeding system using the corrected thickness introduced by N.I. Khvorinov and R. Vladover as a main parameter taking into account the effect of the final dimensions of the geometrical shape of casting or its components on the conditions of their solidification is discussed. Aspects of application Fenoxy-СО2-process are examined: structures, mechanical properties, features of reception of cores.